Cycads are an excellent landscaping plants and come in a range of forms. Growing and feeding and general cycad is not difficult, we tell you how. The most commonly grown cycad in Australia is Cycas Revoluta or the ‘Sago Palm’. however many other species are available. Cycads like water, but hate wet feet. Too much water kills them. Excellent drainage is the most important requirement of proper cycad growth. If your soil is not sandy, plant above ground level in a mound or raised bed. Water must never sit around cycad roots. Mulching the soil in summer is beneficial. Pull the mulch back in winter to allow the excess moisture to evaporate faster. Most cycads can handle drier conditions, but constant moisture is best. Except for a few rainforest species, 95% of cycads grow much better in full sun to 60% sun than shade. Growing Cycads in containers requires the right potting soil, use a free draining type, or add some extra material to help with drainage. Always ensure the drainage holes are clear to prevent water logging. Fertilise with dynamic lifter, blood and bone, and a light application of a nitrogen fertiliser with trace elements. Slow release Osmocote works well for potted cycads. Fertilise in early spring and mid summer during growing season. When planting out seedlings into garden beds, best results are obtained when the plant has 6 to 10 leaves and the caudex is the size of a small walnut. Very small seedlings should be kept in pots for 3-4 years and if deep containers are used, plants grow better. For potted specimens, a little gravel in the bottom of the pots helps the tap root from rotting. A composted pine bark potting mix with little or no sand will ensure the pot drains freely. South East Queensland – ideal climate for most cycads. You can expect them to grow faster here in cultivation than in habitat, provided drainage is good. 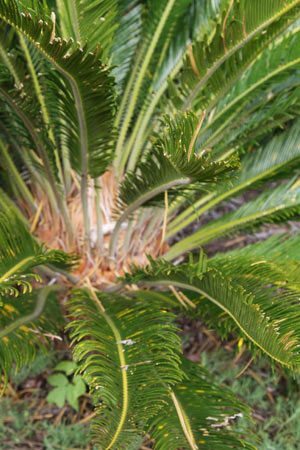 Yellowing leaves on cycads can be caused by a number of factors. Poor drainage is a prime suspect, cycads are used to good drained, a very wet summer or winter can be a problem. The answer is to improve drainage by raising the garden bed and the cycad itself, or installing extra drainage lower down. Under watering is another issue, but not as common. Over fertilising is another cause, and on the opposite end of the scale, extremely poor soils are another. If it just a few lower leaves them this is just the old ones dying off. Usually more of problem with plants that are kept indoors, however they can be a problem outdoors as well. Scale looks like a white of grey coating on the fronds. Usually treated by using an insecticidal soap (Natrasoap is one). Treatment is best carried out in cool conditions, water well spray with the soap solution and keep in the shade. Some scale is worse than others, a scale specific to cycads has been identified in South East Asia, the cycads suddenly look like they are covered in white powder. Usually deadly, however thanks to good bio security this is not prevalent in Australia at the time of writing.